These aluminium spiral stakes are ideal for tomatoes as you don’t need to tie the plant to the stake. You just wind the plant round the stake as it grows, it’s so simple. Be sure to take out the laterals from the plants or you will end up with an out of control, monsterous plant, that has little or no fruit. The laterals are new little branches that form in the fork between the main stem and an existing leaf stem. 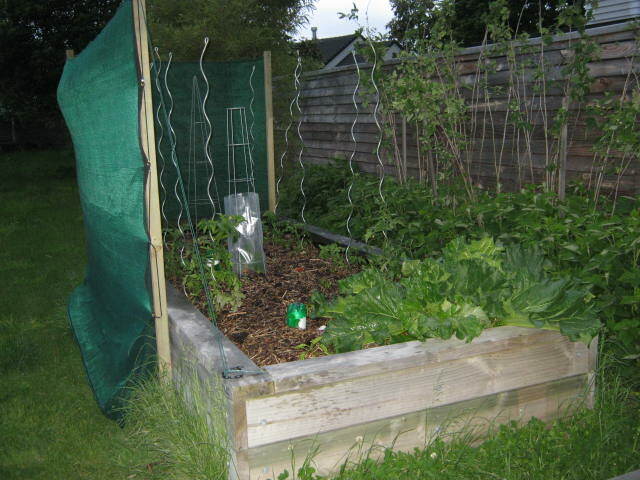 The plastic cloche is protecting a cucumber plant from wind. This entry was posted in Summer, Vegetables and tagged spiral stakes, tomato laterals. Bookmark the permalink.